There’s a sort of axis of travel in everyone’s existence, roads that we travel often at various times that become embedded into us a part of our journey through life. Well worn paths that aren’t exactly desire lines, they are the things that link us together, part of our familial pattern. For me one of these from my childhood is the line of the B1150, the Norwich Road from North Walsham into the city and the B1108 out the other side to Watton. It was the old path that linked us to my brother and my sister and their families. I find both of them strangely comfortable to drive along, there are points on each that always throw me back to childhood and my teens. Captains pond and the mist in the hollows of the wood, Westwick Arch and the Scottow Barn, RAF Coltishall and the low landscape on one side of the city. On the other Earlham Park, Barford and the March of the pylons across the soft downs towards Kimberley and Hingham. I’ve traversed it so many times it feels like a natural route, a wire in the deep circuits and switches of the past. Both roads have probably not been hugely modernised or straightened in years, centuries possibly, the metal has widened but the flow of travel is the same, the corners and dips, natural curves cut by feet and hooves and carts, reinforced by tyres and cars. I grew up at one end of the wire in North Walsham and spent various weekends at Little and Great Ellingham, Wicklewood, Deopham, Wymondham and Attleborough. My mother breathed her last at the end of this line, 35 years after moving to North Walsham, she died in Hingham in a bland, efficient and expensive nursing home. I drove out on the Watton Road, a route through fields slowly coming alive. I’ve not driven along here as much since our mum went, she was the thing that drove us apart and the glue held us close, the need removed by her absence. I like the sweep and rise of the land across the South West of Norwich, the faintly rolling vistas that open up beside you as you drive, the churches poking out of tree lines, the expansive fields with hedgerow relics of older systems the tops shorn flat and frayed by industrial hedge-cutters, controlling the growth the outward pressure of life sawn away. along these old roads I was going to look at the past. Hardingham lies just to the North of the old road. It is an expansive settlement, one of the largest parishes in Norfolk. The modern village is nucleated at the end of the Hackford Road around a green near the hall. Other buildings appear like slow Morse code down the tracks away from the centre outward towards Manson Green, Nordelph, Flockthorpe and Danemore formed around wherever the original main settlement was. 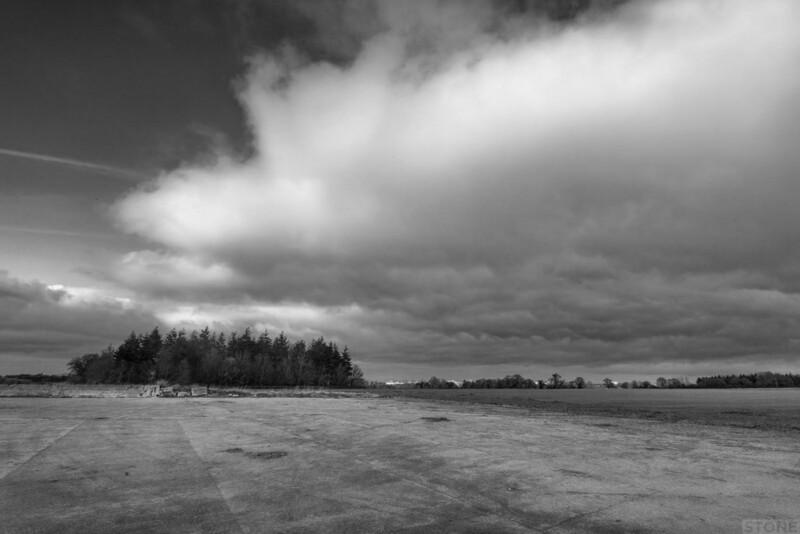 The church is an anomaly, sitting on St Georges Mount isolated a mile to the North of the village which may have drifted away, the original buildings lost to the plough in the fields. St Georges mount is as it suggests a rise in the ground framed by a sandy track and the large old rectory. 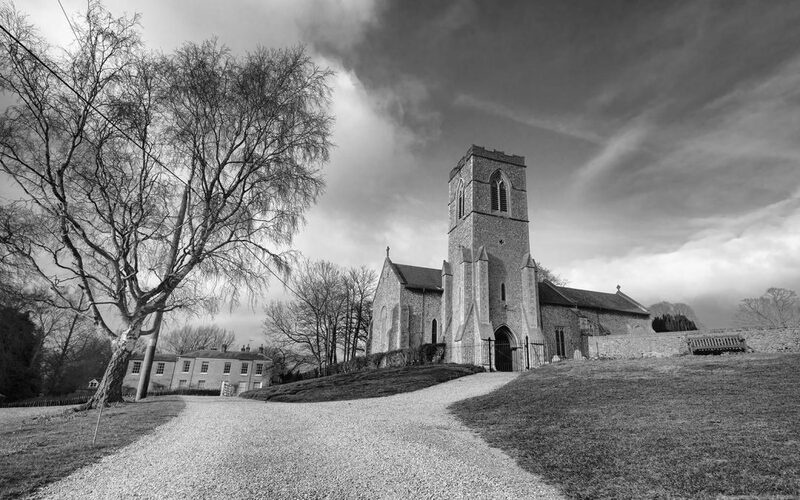 It is an impressive looking building; Fourteenth century with an overlay of Victorian sharpness and angularity and a curious tower that sits to the South side rather than the west end of the church, an addenda to a large old chapel with a large Nave and Chancel. The air is cold, the sun a glimmer fighting cloud, the sky like a grey ceiling. The outer door is unlocked but the inner firmly shut. There are two key holders numbers on a card between various damp notices on a board inside the porch, both ring then go to an answering machine after six rings. What I really want to see is inside hung on a wall. Outside the cloud has come down, drizzle drifts through the irregular graves some canted over, one laying flat another partially lifted reveals what could be a badger set, there are tussocks and molehills and cracked memorials to the rear a set of recent burials look out of place, daffodils and neatly machine cut lettering on black granite in a field of lichen, serifs, and limestone. A key holder rings back, she will bring the key. She is nice, dressed for weekend decorating. We stand and talk. In the age of mass lead theft the first question is unsurprising I’ve heard it before. ‘What is your link to the church?’. I don’t have one, or do I, I’m local, interested in the curious memorial. I might visit some of the boys on my next trip to the Western Front. She smiles and shows me a book; a brief description of each man where known; where he lived, what he did, who his family are. She tells me about the Abels, ‘some of the family still live in the parish, isn’t it funny how names hang on, people are remembered, there’s a little house called Love cottage, named after a women who lived there twenty or more years ago, there her whole life’. The continuity of settlement and community. I offer to drop the key back, her nervousness transformed to trust. I am left alone in the cold in the dimly lit church. 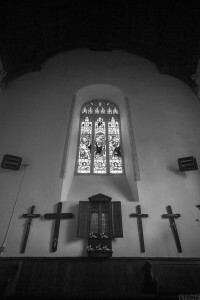 It has been gutted by well-meaning Victorians, the pews are ordinary, the organ quite modern, the walls flat render and paint, there are the usual signs of trapped birds and bats. Stonework has been replaced, machined lines visible on some pieces contrasting the worn softness of the bases and curves of medieval pillars. The memorials in the floor near the alter are nice, cracked and old, solid and black as coal, 1666 cut carefully into the earliest one back in times when the plague destroyed the community, Only Flockthorpe untouched so I’m told. It is a large space and when the sun breaks through the greyness the Victorian glass lights the large plain space beautifully. What I’m really here for lies at the end of the Nave, mounted on the wall like most small war memorials. This one is different though. Central to it is a small board, wood with double doors that are permanently open. Inside brass plates inscribed with the names of 23 men from the parish who died in both wars. The Great War dead on the outer, the Second World War on the inner plates. It is curious, Simon Knott likens it to a dartboard case, I’m at a loss to think of a better description. It isn’t however this which is striking. Despite the litany of misery for a thinly populated parish it is the surrounding items that are surprising. 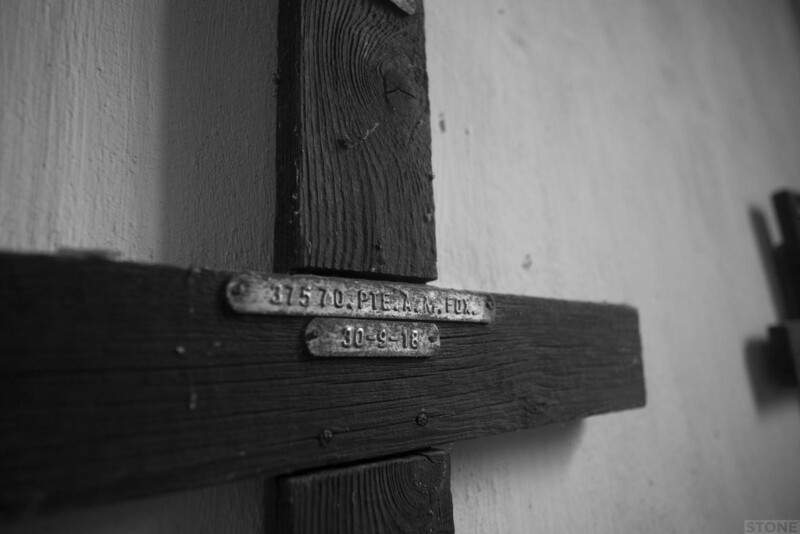 There are four wooden crosses on the wall, each time and weather blackened. They are both alien and at home. We didn’t bring our war dead back, they are still there in the fields and cemeteries of Belgium, Northern France, across Europe, Turkey, Egypt and the Middle East. Across the world. Remembered both there and here in dusty lists, arches and curved walls and on battered memorials in churches, town halls and on village greens. It was accepted that many would never see the grave of their family. Not everyone had the means to go. My own family never did. You can see this on the front in the cemeteries on the line, the chosen wording from the families at the base of the Portland Stone hinting at or even saying directly ‘you are here, but I can never visit, but I will never forget’, too poor, too far away. But here in this church the reverse is true. Someone delivered these, the authorities probably, or maybe someone went to the front and bought back the wooden makeshift grave markers of four of the men and put them here in the heart of the community. They are remarkable, even down to the denuded bases where the wood sat in the ground in the fields out there before the Imperial Graves Commission set them in stone in neat rows of manicured grass. Three of them conform to a pattern IGC put in place. The tip originally dipped in tar, now rotted off, the regulation metal identifying straps, The fourth is different, heavy scrap wood or pieces of ammunition crate fashioned into a cross. All are cracked, shrunken and dry in the air and dim light of the church. Time has had its way with them. It looks as if somewhere over the last century someone has treated them, the wood darkened, almost desiccated and ebonised. On one the remains of Haig Fund Poppy on an old two piece wooden cross has been tacked on. It is an old one, a tin centre and ragged fabric hint at another time of mourning before our mass produced plastic signals of remembrance. Each has a name, rank, serial number marked on a piece of aluminium strap, produced on some hellish conflict-quality Dymo printer, the think strips tacked; details and at the top a grave number. 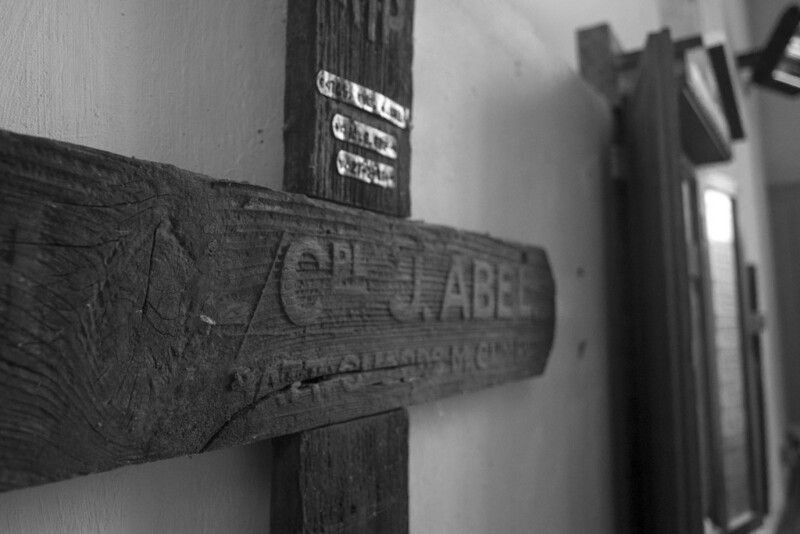 The odd man out is also rather beautifully carved by hand, blocky and narrow grotesques chipped by hand deep into the wood, ‘RIP’ ‘Cpl J ABEL’ ‘DIED OF WOUNDS’ ‘MARCH 27th 1918’. A quick check on CWGC on my intermittent 3G signal indicates he was a Lance Corporal, Service No: 748, Date of Death: 27/03/1918, Age:22, Regiment/Service: Machine Gun Guards 4th Bn. Grave Reference: VIII. R. 51. Cemetery: Cabaret Rouge British Cemetery, Souchez. His physical remains lie just North of Arras. Yet somehow he really is here, in the eyes of the congregation of the church and also in the folds of the land and the memory of place and the genetics of family. The last line as is usual on these records is the personal the ‘Additional Information’ as it’s officially called, the bit that makes this collection of words and numbers a real human. He was the ‘Son of Henry and Annie Elizabeth Abel, of “Old Bird in Hand,” Hardingham, Norfolk’. A small amount of digging reveals more of his movements at the front as his parents continued to do their labouring jobs out here in the fields. He had been in the Scots Guards, presumably he’d been picked or volunteered to train as a machine gunner. He was involved doing this with the Guards at the First Battle of Arras, and died in the hands of the Ninth Field Ambulance. On the internet he exists in pixels, a digitised portrait in the Picture Norfolk collection (Right), some census returns to 1911. He also exists in the scans of War Ministry papers, all of which catalogues on discoloured paper covered in pencil marks, the ticks and crosses that signal his death but so little of his living. His pay, his medal entitlement, where he is, but so not much else. And next to him is something else. His brother, etched into the brass. 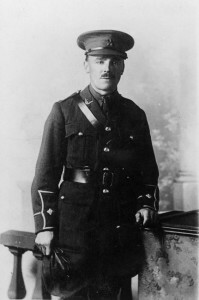 Second Lieutenant Frederick Abel, 3rd Battalion Norfolk Regiment, 30th December 1917. He drowned at sea he had been aboard the troop ship SS/HT/RMS Aragon as it waited to pull into port at Alexandria, torpedoed by UC-34, a German submarine. She sank fast, 610 men and women died in the blast and the water. He was only 31, married to Louisa, they lived in Coston just up the road. He is interred at Chatby Cemetery and memorial in the port. 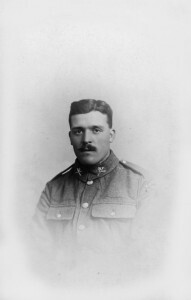 In a family of eight children all the boys appear to have served, Harry the eldest was a regular before the war with the 1st Norfolks, and finished his service in 1920 in the Labour Corp. Arthur appears to have also been in the Norfolk Regiment the 2nd Regiment and also seems to have been a regular, serving from at least 1911. Francis appears to have been in the Labour Corp, a sergeant. The girls; May and Henrietta would have known the deprivations, the worry and the hard work of being at home, probably taking over the jobs on the land vacated by the men, perhaps unwittingly taking steps on the road to emancipation. Two sons and brothers gone in less than a year. There probably extended family on here, the name Hunt rings a bell, could they be related to Annie Elizabeth, before marriage she too was a Hunt. It is horrific the way the war tore through everything, terrible and sobering. There is something else physically missing though. I know from a visit by a friend there was at one time a shell case inscribed with ‘High Wood 1916’ a gift from the Somme to the Rector in memory of his son named on one of the crosses. Geoffrey Stephen Walley, the only child of the rector at the time, Stephen Cawley Walley and his wife Mercy, Rector of this Parish, and Mercy, his wife. He died at High Wood on 20th August 1916 aged 24 and is buried at Dernancourt cemetery near Albert. It turns out it has been leant to someone to look at, to remember with. I lock up carefully and leave, driving back up towards Danemoor to drop off the key I’m suddenly struck by the form of the landscape. So much so I pull over on a patch of concrete on a rise in the ground above the church, to the North lies a block of woodland squared off hunkering down on the plateau against the soft curves of the countryside, piles of marl ready for spreading nearby, the plough lines in the reddened soil heading off to the horizon, these downs on the edge of Breckland those trees could almost be High Wood. It is strange, in these dawdling paths of the mind how we react when confronted by these wooden remains of people’s very real past lives, shared grief from the front brought home. Like an echo, from one end of a road to another. This article first appeared on Invisible Works in March 2016. Photos and text © Invisible works/Nick Stone. Portraits of the Abel brothers are from the collections of Picture Norfolk. Interesting and intimate account throughout. Thoughts alone in the church with relics of Norfolk’s soldiers in the battle of europe. The retrieved wooden grave markers (were they brought back from france and if so by whom?) Are especially personal. The Abels were well-known and still run the auction and house-removal business in Watton.